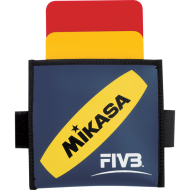 This tape marks the vertical extension of the side lines of a volleyball court and is only available from Mikasa. 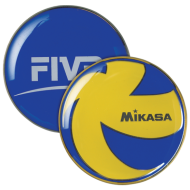 Notice in the picture at the left that the antenna is fitted on the outside of the side band tape, that is why if the antenna is touched by the volleyball it is ruled out by the referee. Some people try to mount the antenna on the side band tape, please note that this is "not" correct. 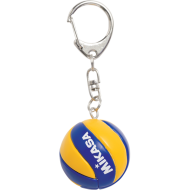 Every volleyball net "should" have both a side band tape and an antenna on each of the sides of a court.